How do I apply for enrolment as a GST Practitioner? What are the steps involved in applying for Registration as a GST Practitioner (GSTP) on the GST Portal? 2. Click the REGISTER NOW link. Alternatively, you can also click Services > Registration > New Registration option. 4. In the I am a drop down list, select the GST Practitioner as the type of taxpayer to be registered. name as mentioned in the PAN database. 7. In the Permanent Account Number (PAN) field, enter PAN number. Note: • In case you don’t have PAN, you can apply for PAN. To do so, click the here link. 8. Legal Name of the GST Practitioner and PAN will be validated against the CBDT database. 9. In the Email Address field, enter the email address of the Primary Authorized Signatory. 10. In the Mobile Number field, enter the valid Indian mobile number of the Primary Authorized Signatory. 11. In the Type the characters you see in the image below field, enter the captcha text. After successful validation, you will be directed to the OTP Verification page. 13. In the Mobile OTP field, enter the OTP you received on your mobile number entered in PART-A of the form. OTP is valid only for 10 minutes. 14. In the Email OTP field, enter the OTP you received on your email address entered in PART-A of the form. OTP is valid only for 10 minutes. Note: OTP sent to mobile number and email address are separate. In case OTP is invalid, try again by clicking the Click here to resend the OTP link. You will receive the OTP on your registered mobile number or email ID again. Enter both the newly received OTPs again. 15. Click the PROCEED button. 16. The system generated 15-digit Temporary Reference Number (TRN) is displayed. as well as your mobile number. Note that below the TRN the expiry date of the TRN will also be mentioned. Click the PROCEED button. and select the Temporary Reference Number (TRN) radio button to login using the TRN. 1. In the Temporary Reference Number (TRN) field, enter the TRN generated. 2. In the Type the characters you see in the image below field, enter the captcha text. 3. Click the PROCEED button. The Verify OTP page is displayed. You will receive same Mobile OTP and Email OTP. These OTPs are different from the OTPs you received in previous step. 4. In the Mobile / Email OTP field, enter the OTP you received on your mobile number and email address. OTP is valid only for 10 minutes. Note: OTP sent to mobile number and email address are same. 5. The My Saved Application page is displayed. Under the Action column, click the Edit icon (icon in blue square with white pen). Notice the expiry date shown below in the screenshot. If the applicant doesn’t submit the application within 15 days, TRN and the entire information filled against that TRN will be purged after 15 days. The status of the registration application is ‘Draft’ unless the application is submitted. Once the application is submitted, the status is changed to ‘Pending for Validation’. 1. PART-B of the form has four sections that must be filled sequentially. The first section is General Details. Enter all the details and click SAVE AND CONTINUE at the bottom of the screen. b) Under enrolment sought as, please select an option from the dropdown given. c) Enter the name of your University/Institute where you received your academic credentials. d) Select your year of passing from the dropdown menu. f) Under Proof of Qualifying Degree for enrolment as a GST Practitioner, select the document type from the dropdown given. g) Upload the document in PDF or JPEG format only (file size must be less than 1 MB. h) Once you have filled in all the sections, click on SAVE AND CONTINUE to move to the next section. 2. The second section is Applicant Details. a) Select your date of birth. b) Enter your first, middle, and last name (first name is mandatory). d) If you wish to use E-Sign or EVC, enter your Aadhaar Number. e) Enter all the details and upload your photograph. g) Once you have entered all the details and uploaded the photograph, click SAVE AND CONTINUE to move on to the next section. 3. The third section is Professional Address. a) Enter the address with the correct PIN Code. State and District will be auto populated from PART-A of the form. b) Select the appropriate proof of professional address from the dropdown menu. c) Upload the selected proof of professional address in JPEG or PDF format with a file size not exceeding 1 MB. d) Once all the details are entered and the document is successfully uploaded, click SAVE AND CONTINUE to go to the final section. 4. The fourth and last section is the Verification page. a) Check the check-box with the verification statement. a) Click the SUBMIT WITH DSC button. b) Click the PROCEED button. g) Select the certificate and click the SIGN button. on your e-mail address and mobile phone number. 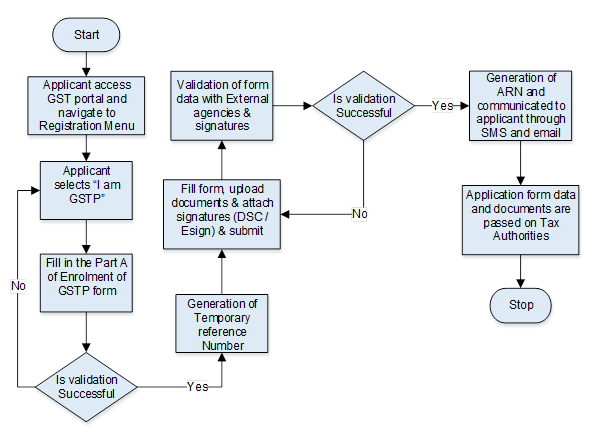 You can track the status of your application using the Services > Registration >Track Application Status command. e) Click the SUBMIT WITH E-SIGN button. f) In the Declaration box, click the AGREE button. address and mobile phone number registered with Aadhaar. h) Click the CONTINUE button. a) Click the SUBMIT WITH EVC button. b) In the Declaration box, click the AGREE button. Note: OTP will be sent to your mobile phone number registered with Aadhaar. c) Verify OTP screen is displayed. Enter the OTP received on your mobile phone number registered with Aadhaar. d) Click the CONTINUE button. Note: After submission, you cannot make any changes to your application. Can person doing job in company not having professional address enroll for GST practioner ?